Camping in Windermere provides water-based fun, walking and all of the attractions of the Lakes are accessible from this site. Our family-friendly Windermere campsite is betwixt popular Bowness-on-Windermere and the bustling market town of Kendal. Its location makes it ideal for exploring both towns and the varied attractions of the southern Lake District. Sit back and enjoy the peace and tranquillity of this campsite near Windermere, with plentiful wildlife and the wonderful views. Windermere is not only spacious, it’s well laid out and boasts many environmentally-friendly facilities. There is a separate tent camping area, backpacker facility, a family camping area, children’s play area and a 4* rated pub restaurant The Whistling Pig. There are many walks from the campsite. Across the fields is the village of Staveley as well as a shop, supermarket and a couple of pubs the Hawkshead Brewery is here too. There are more walks to enjoy from the village including Potters Fell and Reston Scar. Bowness-on-Windermere offers plenty of water-based activities including cruises, canoeing and wind surfing and attractions including The World of Beatrix Potter and Aquarium of the Lakes. Take the chain ferry to the western side of the lake and visit the pretty village of Hawkshead and Claife Heights, National Trust woodland great for walking, cycling and wildlife spotting. Fell Foot Park at the southern tip of the lake is perfect for picnics or a swim in the lake. Camping Pods are also available at this campsite. The site is accessed via a long narrow lane with some passing places. 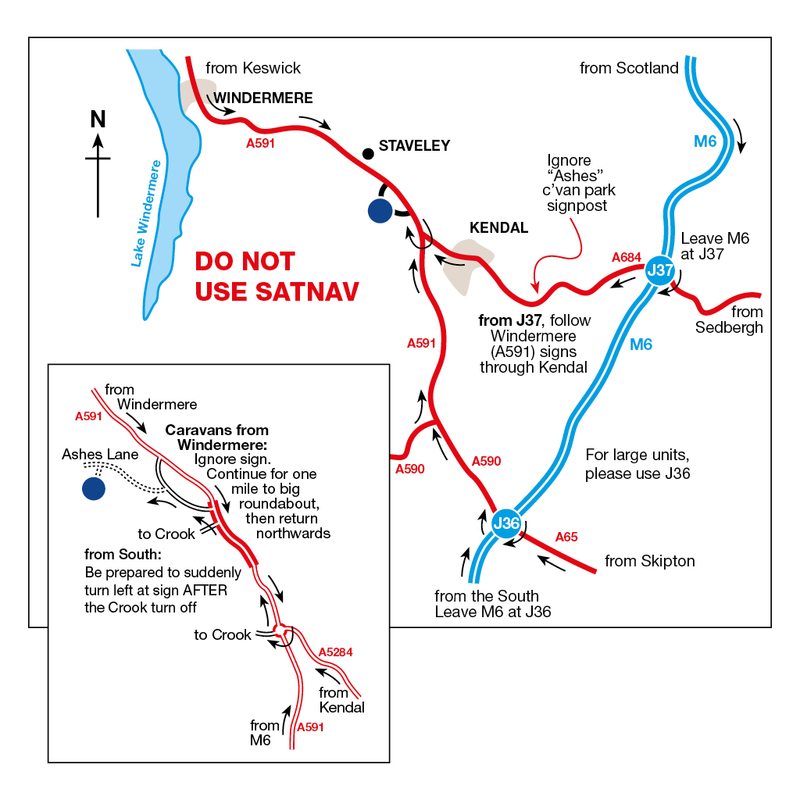 Please ensure that you are entering the site from the A591 only. The Site shop sells locally-reared bacon. There is a farm shop with a butchers and delicatessen at Plumgarth. If you’re planning to explore the northern Lakes, our Keswick camping site on the shores of Derwentwater is hard to beat as a base for your explorations.